Here we have a country that has been divided in 2011 between Muslims and Christians, North and South Sudan, and it's not working out well at all. Barack Hussein Obama has a scandalous half brother. Word is on the streets that Malik Hussein Obama is reported to be buying recruits in the Sudan for as much as $5,000 American dollars for the Muslim Brotherhood. Where is he getting this money from? Who he has formerly been known to associate with has been Omar al-Bashir who was behind the attack on the US embassy in Khartoum, Sudan. This attack occurred at about the same time as the Benghazi attack. If the money is coming from Bashir, how is he getting so much American money? It appears that the embassy attacks have lost momentum on the TV news. Nothing much has been said about who the perpetrators were, though there was a lot of haggling over it. Omar al-Bashir is the president of North Sudan. He is known to have a despotic government. Al-Basir is something like Hitler, an Islamic tyrant responsible for the deaths of over 3 million people in the name of Jihad. He has held a war against Christians. American embassies in Egypt and Libya have been attacked by Muslims. Muslim mobs have now raided the British, German and American embassies in North Sudan and again, Omar al-Bashir is the one responsible. Who seems to be stopping the revolution against this Omar al-Bashir? By supporting the Islamic uprisings, it is President Obama. His administration is in support of the rebels in Syria, so has condemned Assad. Obama prevented Salva Kiir, the Christian president of South Sudan from aiding rebels who wanted to topple al-Bashir's regime. Omar al-Bashir, a Muslim leader, has been receiving a lot of protection from Obama. Salva was President of South Sudan by gaining its independence from North Sudan in 2011. Salva is a devout Christian. ""Indeed, many political analysts and opinion leaders worldwide describe him as the Biblical Joshua who took the mantle of leadership from Moses just as the Israelites were on the verge of entering Canaan and capably established the then fugitives in the Promised Land," the South Sudan government says on its website. Malik Obama is the Executive Secretary for the IDO, (Islamic Da'wa Organization which is in Khartoum, Sudan. Their primary focus is to expand Wahhabist Islam in Africa. 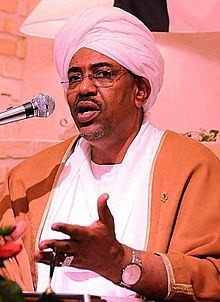 Bashir was in Khartoum where he declared that he was going to make Sudan's constitution 100% Islamic. Malik Hussein Obama shares this ideal with Bashir. Both men attended the general Conference of the Islamic Council of South Sudan and a meeting for the Islamic Da'wa Organization with the Board of Trustees. Malik Obama is an Executive Secretary in the Dawa Organization. A fatwa against Christians which Malik Obama is all for is the cause of violence against Christians in Africa today. Bashir's thugs are slaughtering and attacking Christians in front of Kambouni playground with sticks and machetes. Bashir's government is enforcing Arabic to be the language of the land and are deporting missionaries while bulldozing their churches. It was in 2012 that Bashir gave Christians until March 1st to leave North Sudan, but one half a million were stranded there and became targets for shooters. Sudan is the 8th highest Muslim majority country in the world out of 48. The country has been 70% Sunni Muslim with 43,939,598 population. Malik Obama is from Kenya. He is being accused by the Egyptian government of managing funds for the Muslim Brotherhood in Egypt. Egypt's Tahani al-Gebali, former chancellor and adviser to the constitutional Court of Egypt is claiming that Malik Obama is the architect of the Brotherhood's financial investments and this is the reason that the USA cannot fight the Brotherhood. Malik heard the allegations and calls them nonsense. Criminal charges have been filed in Egypt against Malik on the basis of Gebali's accusation of him managing investments for the Muslim Brotherhood in Egypt. Malik says that he hasn't been in Egypt and that as a Muslim he doesn't promote hatred or violence and has never belonged to any extremist group in his life. That would sure rule out the Muslim Brotherhood for they are all of that. However, he is the secretary of IDO, created by the Sudanese government which is a terrorist state by the standards set by the USA State Department. How this all involves Israel is very simple. Malik is the chairman of IDO now, having been secretary. He is very close with his boss, Al Dahab. Al Dahab is very close with Hamas's prime minister, Ismael Haniyeh, and also the religious leader of Hamas, Qaradawi, formerly of Egypt. In fact, when Morsi was president, he spoke to the people in Egypt. Qaradawi is the head religious leader of the Muslim Brotherhood and of many Muslims. In the 2000s, a large number of undocumented Africans entered Israel illegally through the fenced border between Israel and Egypt. About 26,635 came by July 2010 and over 55,000 in January 2012. They were seeking an asylum status under the UN laws. Only a few were really eligible for this. Most were citizens of Eritrea and Sudan and could not be forcibly deported from Israel. Eritrea has a difficult internal situation and those people are defined as temporary humanitarian protection group. Israel was in fear for the Sudanese and did not deport them back immediately. Israel had to grant a temporary residence permit to be renewed every 3 months. Most live in Tel Aviv and Eilat. They were causing many problems and were accused of robbery. Now the Sudan is being stirred up again with plenty of fighting going on.